As the United States continues to be in an economic crisis, restaurants are still finding it challenging to not only get new customers, but keep the ones they already have. Menu covers set a classic and upbeat tone and are well remembered... but more is required to keep valued patrons returning. Loyalty promotions have shown the way how to entice your customers to return in the future. In fact, the National Restaurant Association found that 57% of people are more willing to go to a restaurant with a rewards program, as was shown by their 2015 Restaurant Industry Forecast. Restaurants everywhere are encouraged to implement a rewards program that will offer incentives to their customers as a way to promote their restaurant and have customers coming back for repeat visits. Not only can you see a larger customer base with your loyalty promotion programs, but it is one of the best ways to encourage repeat customers. Specific ideas to assist you in Loyalty implementation..
1. 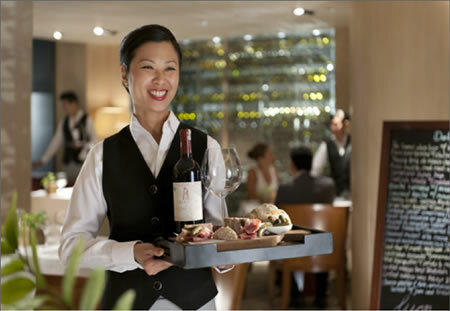 Point System – One of the most basic loyalty promotion ideas for restaurants is by using a point system. A point system works by first deciding on the rewards you would like to give out, and then deciding how many points it would take for a customer to receive that reward. You will offer points to customers based on any criteria you like, such as a certain number of points for each visit, points for each dollar spent or points for ordering certain items off your menu. Once they have compiled enough reward points, they will receive a reward. 2. Tier Rewards – You can also use the rewards program a little differently by setting your returning customers at different tiers. Your tiers are like levels; the more the customer visits your restaurant or reaches a certain amount of points, they will move up a tier. Tiers can be based on any level you want, whether that is stages or colors like bronze, silver, gold, and platinum. The latter tends to work best because most customers will understand which levels are lower and which are higher. Your rewards should be worth more at the higher level tiers. 3. Exclusive Promotions – Another way to offer a loyalty promotion program to your customers in through exclusive promotions. This means the rewards and promotions offered to your customers are only going to be received through a select group of customers, which can make it more valuable. The customers in this exclusive group of people can be determined by your own specifications, such as customers who have a reached a certain number of visits, or who have signed up for other points program that are available and have gotten a very high number of points. 4. Games – To get your patrons more involved and have a fun time enjoying the promotions program is by offering games and various customer building events. The game you choose can be anything you want, but scratch tickets tend to work very well. These tickets will have awards or prizes on some of them, and you can give one to each person for each time they visit. The more times a customer visits your restaurant, the better chances they have to win. 5. Positive Feedback – You always want your customers to visit your website or blog more often and increase the traffic to your website; you can incorporate a rewards program in your online presence. Tell your customers that each time they leave a positive review of your restaurant on your blog or website’s review page; they will get some sort of reward. This can be a free dessert or drink, a percentage off their total bill, or can collaborate with other rewards programs you have available such as the exclusive promotions program. This not only gives customers a reason to come back and receive their reward, but it increases the traffic of your website and encourages new customers to try out your restaurant. 6. Specific Item Sales – A great loyalty rewards program uses specific item sales. This program works best if you have a desire to sell certain items in your restaurant, such as a signature drink or a dessert you’re especially proud of. If you have a new menu option you can inform customers that each time they purchase the specific item, they will receive a certain number of points to go toward a reward. It can also be used as an instant reward such as giving them ½ off a dessert if they order the signature item on the menu. 7. Restaurant Social Media Program– Social media is becoming the go-to marketing plan for many businesses, restaurants included. There are dozens of ways to implement a rewards program into social media platforms. For example, you can give followers of your Twitter or Facebook page a special deal, discount or promotion. You can also let customers know that if they “check in” at your restaurant with a social media website like Foursquare or Facebook, they will get a reward. The check-in feature informs all their friends where they were and is great for getting new customers in your establishment. Please do check out Menucoverman's Restaurant and Social Media Marketing guideline page. These inventive loyalty promotion ideas and rewards programs encourage customers to try out your restaurant for the first time as well as enticing them to return time and time again. By introducing rewards consumers will want to win or earn, you can create a simple rewards program at your restaurant that increases the traffic of your business. Regardless of the type of program you decide to go with, you can increase your overall customer base and the success of your restaurant with a customer loyalty promotion program.